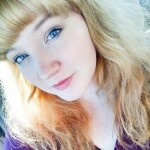 If you are reading this article, you have been blessed with long, thick, and curly hair. 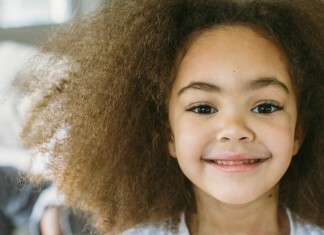 Embraced your inner beauty and let your curls run wild; your unique hair is what makes you you. 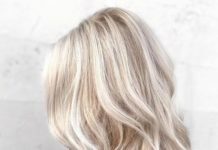 However, we understand that picking a hairdo that is both doable and glamorous can be difficult with long, thick, curly hair. Let’s face it: humidity is not your friend and many of the elaborate looks your thin-haired friends can pull off are just not for you. Whether you’re looking for hairdos for the office, girl’s night out, date night, or merely for lounging about, we have compiled a list that we are sure will delight all of our long, thick, curly-haired gals. 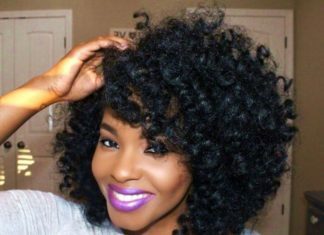 The following 20 hairstyles are perfect for our ladies with long, thick, and curly hair—we hope you enjoy them as much as we do! This first hairstyle uses a deep side part to create dramatic volume and a beautiful frame for your face. This look is perfect for class or work and can be easily achieved. 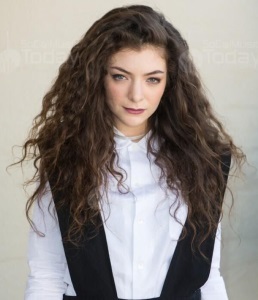 Pair with a simple cat eye and vampy look like Lorde for extra ‘wow’ factor. 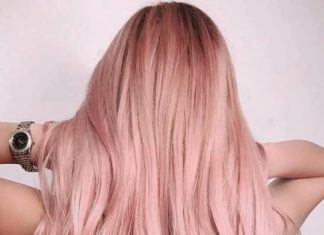 Another easy to achieve look, this hairstyle is great for keeping flyaways out of your eyes and looking polished without much effort. For a more dramatic look, braid the strands you pull back or use embellishments like diamond pins or a bow. 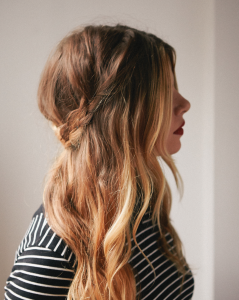 A half-up, half-down look is good for any occasion. 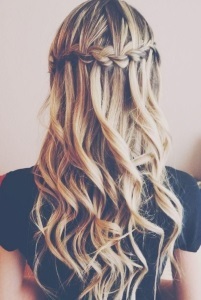 A bit more complex, a mermaid braid is still a wonderful style for long, thick, curly hair. The more length you have, the longer the braid. For an effortless and loose look like the one pictured, tug on the strands of your braid after securing with an elastic. This look is especially perfect for nights out with your girls! If you are after a bold new ‘do, look no further than the sideshave. This look is achieved by shaving or cutting one side of your hair incredibly short, allowing the rest to fall naturally. This hairstyle can also be achieved by tightly braiding one side of the hair and pinning it beneath the other for a faux-shave. Let your inner wild child loose with this dramatic ‘do! Another braided look, you can achieve this hairstyle with peekaboo strands that create a band around the top of your hair. This hairdo can be played around with—try switching up your braid with chunky and thin strands or put some flowers in the braid as well. If you are looking for a new style for class or perhaps a new date night look, a waterfall braid may be perfect for you! Achieve this gravity defying look by pulling all your hair atop the center of your head and securing with an elastic. For added fun, leave a strand loose and wrap around the elastic afterward, pinning the end to hide the elastic. This updo is flirty and fun; pair it with chunky jewelry like Rihanna for added enjoyment. A crown without the diamonds and gold can be just as pretty. This relaxed hairdo is perfect for date night or simply to spice up an everyday look. It can be paired with a bold red lip (as pictured) or simple, natural makeup. This hairdo screams “rockstar”, doesn’t it? You can achieve this look by teasing out the front section of your hair and pinning at your crown; simply pin the rest of your hair or let it flow free for this glamorous ‘do. If you need a new gal pal hairstyle or simply a break from the norm, try out a half-pompadour. A low side bun is a versatile yet polished look perfect for parties or a night out with the girls. We love how Taylor Swift pairs this hairdo with natural makeup, allowing the sweetness of the style to shine; add waterfall earrings to further heighten the effect. This girly low-do is ready for date night, the office, or hangouts. 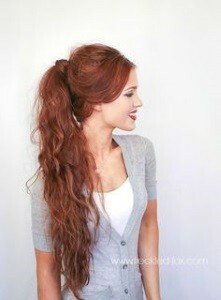 The double ponytail is great for extra volume, especially for second day hair. 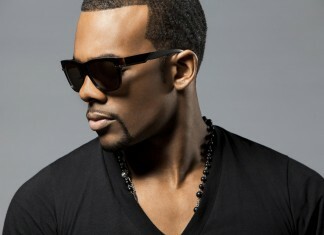 To achieve this style, take the top half of your hair and tie it with an elastic at the crown of your hair. Then, take the remainder of your hair and secure an inch or so below. Fluff out the top ponytail for a dramatic, volumized hairdo great for a variety of situations! 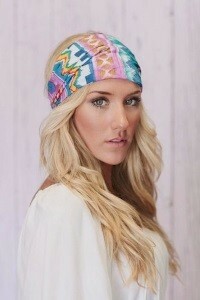 This style can be dressed up or down depending on the headband you choose. Instead of hiding the back half below your hair, choose a headband with an all-around design to be worn just over your eyebrows. Play around with different headbands for different looks. We suggest trying headbands with pearls, funky patterns, or multiple strands. A classic hairstyle, the French twist is a perfect hairdo for thick and curly hair. It can be embellished with hair ornaments or tightened/loosened for a variety of different looks. If you are looking for a hairdo perfect for the office or a special event, this is it. 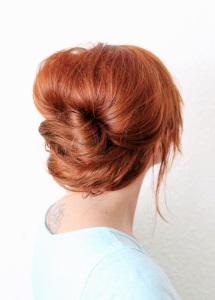 If you value time and convenience, a sock bun may be ideal for you. Simply take an old sock and snip off the toe, then roll into a circle. Pull your hair into a high ponytail, slide the sock-circle around it, and tuck your hair underneath the sock. Pin it for added security and voila!—a cute but time-effective hairdo perfect for dates or for work. Channel your inner Miley Cyrus with bunny buns. Part your hair in the middle, then take each half and wind atop your head, pinning into two identical buns. To tone down the ‘cutesy’ vibe, pair this look with a dark lip or smoky eyes. Try this look for your next night out on the town or to keep hair out of your eyes while you’re doing chores. This creative look breathes new life into the term “hair bow”. While this ‘do may seem tricky, it is actually just the clever use of two buns, a strand of extra hair, and some bobby pins. You can wear your hair bow with a half-do or pull all your hair atop your head for added glamour. Try this look for date night, the office, class, or any other situation you need a dash of glamour. Another look that’s good for second-day hair: slicked back. You can copy this hairdo by taking styling gel and smoothing the front of your hair back for a secure hold. This look is perfect for class or a day spent running errands. For a dramatic effect, pair with smoky or dark eyes. 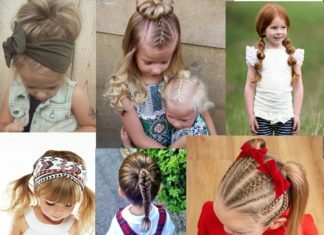 Wraparound braids breathe new life into both French braids and a crown braid. 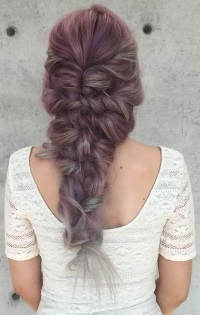 Start with two French braids and pin around the back of your head for a unique look. If you want to be even more daring, use spiral pins or sparkly clips to draw more attention to your new ‘do. 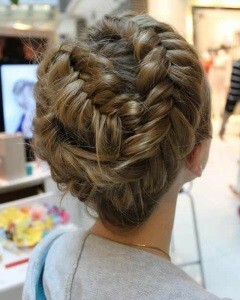 This hairstyle is especially beautiful for special events. The chignon is a classic look for brides, but don’t let that stop you from using this updo in everyday life. 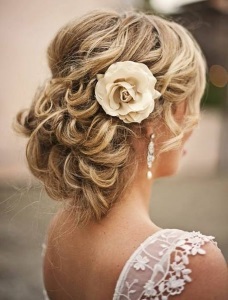 Pin a rosette in your hair (as pictured) or use a bejeweled comb to bring glamour to this classic look. If embellishment isn’t your thing, go plain for a sweet and romantic vibe. Use this hairstyle on your next date or for a special night out. Pair your next topknot with half of your hair down for a relaxed, beachy vibe. We love how this model dressed hers up with a chambray shirt for an effortlessly cool vibe. This ‘do is lovely for hanging with your ladies or lounging around the house. Breathe new life into your standard bun by leaving a strand of hair loose, rope-braiding it, and pinning around your bun for a fun new look. Say “goodbye!” to the boring ballerina bun in exchange for a braided bun. This hairdo is best when paired with glamorous makeup or for a night out on the town. 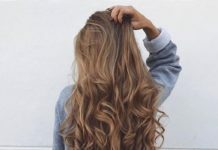 We hope that these 20 hairstyles for long thick curly hair have inspired you to try a new look for you next night out. 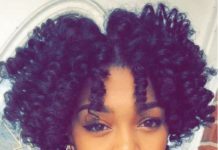 Whether you lean more towards the casual or the ritzy, any of these 20 hairstyles would be perfect for long, thick, and curly hair. 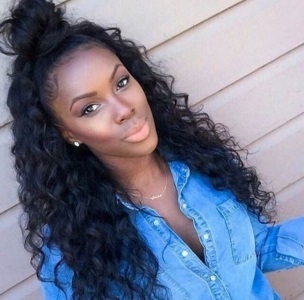 Try styling your next girl’s night out with a deep side part or wear a braided bun for your next date. If you enjoyed this article, we hope you take the time to try one of these looks soon. Remember: life (and beauty!) is all about taking risks to let your inner spirit shine through.